"They're back on the mean streets. But this time, they're the good guys." 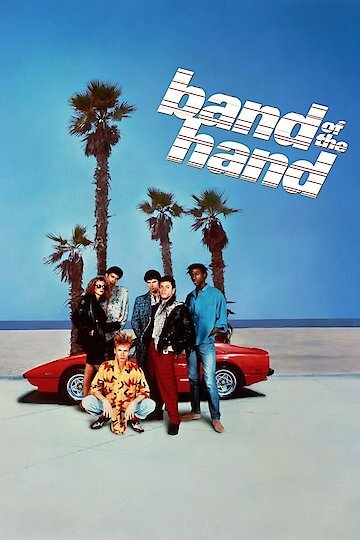 Band of the Hand is an urban drama written by Leo Garen and Jack Baran and directed by Paul Michael Glaser. Indian Joe, played by Stephen Lang, is hell-bent on saving the worst of the worst intercity youths. He convinces the judicial system to give him five of the toughest young men they have in jail. He wants to try to rehabilitate them with unorthodox techniques. The state grants him five of the worst young men in their custody. Indian Joe will do what is needed to change them into productive citizens. The young men are dropped off in the Everglades, where they meet Indian Joe. He teaches them to depend on each other like the fingers on a hand. This was hard for this group because they are used to being independent and have little faith in adults. One by one, they begin to bond like brothers. It's a trying time, but they make it through. Indian Joe feels they have progressed enough to return to society, to a house he bought in the city of Miami. Upon arriving at their new house, they discover it is filled with drug addicts. They run the addicts out but notice that the addicts only move to the park across the street. The local drug dealer, Cream, played by Larry Fishburne, arrives and encourages the addicts to take the house back. Indian Joe and the boys fight back and keep their house. The drug lord, played by Nestor Quintana, has pressure put on Cream about his declining sales. Cream and his crew go back to the house, cause a ruckus and shoot Indian Joe. The boys do their best to keep the house but are burned out. Indian Joe is dead, and the boys want justice. Now they have the skills to do it. Band of the Hand is currently available to watch and stream, buy on demand at Amazon, Vudu, Google Play, iTunes, YouTube VOD online.